Location: Nr Cliffony, Co Sligo, Ireland. Grid Reference: 54.44° N, 8.43° W.
There are over 350 known court-tombs in the whole of Ireland, but only five are in the south. Creevykeel, adjoining the Sligo-Bundoran road 2.4km (1-1/2 miles) NE of Cliffony, is certainly the most impressive and has been thoroughly restored. 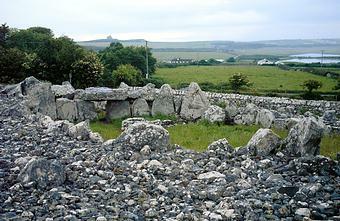 Creevykeel is also known as the giant's graves as three tombs once existed in this area. Two have since disappeared, at least one since 1912. This great court tomb was first excavated during the Fourth Harvard Archaeological Expedition to Ireland in 1939. It was shown as an antiquity on the 1909 OS Maps. 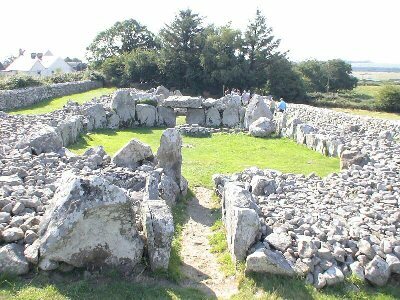 Located within a wedge-shaped cairn, this tomb was originally about 61 m (200 ft) long. At the eastern end is the main entrance, through a small passage, which leads into an oval forecourt. Originally paved, the forecourt is very large : 17 x 10 m (56 x 33 ft). Close inspection shows a change in size of the orthostats ending the court, as if they might have been built in more than one phase. The tomb continues on beneath a lintel stone through two successive chambers, where four cremations have been found. Even further on are the remains of a possible three more burial chambers. During Hencken's excavations of 1935, a chalk ball was discovered at Creevykeel, it is an item similar to those found in Brittany, which may be a further confirmation that court-tombs often slightly pre-date passage-tombs. Other grave goods included Neolithic pottery, leaf-shaped flint arrowheads, hollow scrapers, and polished stone axe-heads. Other 'Court-tombs' are found in Sardinia, where they are referred to as 'giants tombs'.